On the face of it, a smoke detector should never be associated with the word ‘hush’. It really only has one job, and that’s to detect potentially deadly smoke so people can get out of the house safely. That whole concept flies out the window if the smoke detector is busy whispering to you that you’re just inches away from going up in flames. But there are situations where your smoke detector will ‘think’ that there’s dangerous activity in the home when you’re really only making dinner for your hungry family. See how hush mode works, what options are available to you, and why you might want to use it. The hush mode on a smoke detector is a temporary means for you to do what needs to be done without the hassle of a blaring alarm. So if you know that the smoke alarm will always be triggered when you use oil with a high smoke point, then you can hit the hush mode to desensitize the detector for about seven minutes or so. As long as the smoke is thin enough, the alarm will be silent as the grave…until it lets out a chirp every half minute or so. The chirps may be annoying, but they’re far less annoying than having to wave a towel in front of the smoke alarm to get it to turn off every few minutes. Once the seven minutes have gone by, the alarm will reset itself completely. It will stop the chirping noises, and return to its original state. This means that homeowners don’t have to remember to turn the smoke detector on and off every time they cook, take a shower, or light a match. The only warning with this feature is that if there’s still smoke hanging in the air after seven minutes, then the alarm will sound. There’s also a smart hush feature that will disable the alarm for about eight minutes or so. It works similarly to the regular hush feature, except it can’t be used unless the alarm is actually going off. Smart hush will usually feature a red light flashing as opposed to a chirp to indicate that it’s in hush mode. First of all, it’s important to answer the question, “how long do smoke detectors last?” Most detectors last around 10 years. 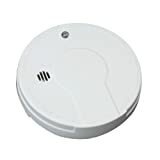 Overly sensitive alarms are usually why homeowners will even need to use the hush feature — which may be a sign that you need to replace your smoke detectors completely. 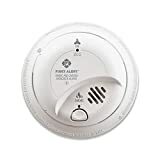 New smart smoke detectors may be a better bet for you in the long-term than having to remember to hit the hush button every time 6:00 rolls around. 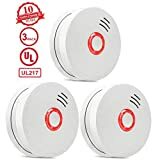 Smart smoke detectors are so intuitive that they will only let you know when there’s an actual threat in the home — including both dangerous flames and carbon monoxide. It can also tell you if the fire alarm is triggered if you’re not in the house by contacting you on your smartphone. In addition, smart smoke detectors can save you about 5% on your insurance premiums due to the extra safety of your home. And speaking of extra security in your home, there are a number of ways that you can keep your home protected from practically any threat you can think of. We encourage you to call Protect America today if you’re looking for equipment and solutions that can make your home a far safer place to live. From criminals to natural disasters, there are ways to be proactive when it comes to your property. We’re happy to help you find the perfect level of security — no matter what your priorities happen to be!